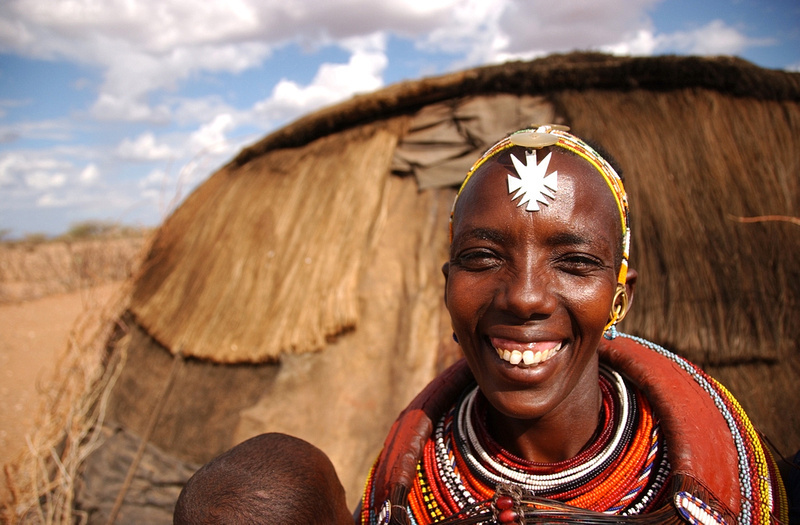 Location and Background: The Rendille live in the Kaisut Desert east of Lake Turkana, as semi-nomadic pastoralists. There are two distinctive groups: the northern Rendille, who herd camels, and the southern Rendille who herd cattle as well, and are related to the Samburu with whom they intermarry—Ariaal Rendille live closer to main roads and have more contact with the outside world. History: The Rendille are Eastern Cushitic peoples who migrated from the Suez Canal and Ethiopia, moving south to escape rivalry and conflicts over grazing land and water for livestock. Their oral history claims they are of Jewish descent and their Passover-type ceremony called Sorio (“sacrifice to God”) includes the slaughtering of a sheep by the first-born son and putting the blood on their doorposts. Culture: The camel is their essential animal, and the development of boreholes has allowed them a less nomadic lifestyle. They live in “manyattas” or homesteads of 70-100 houses, and they dress in bright colors and wear beads. 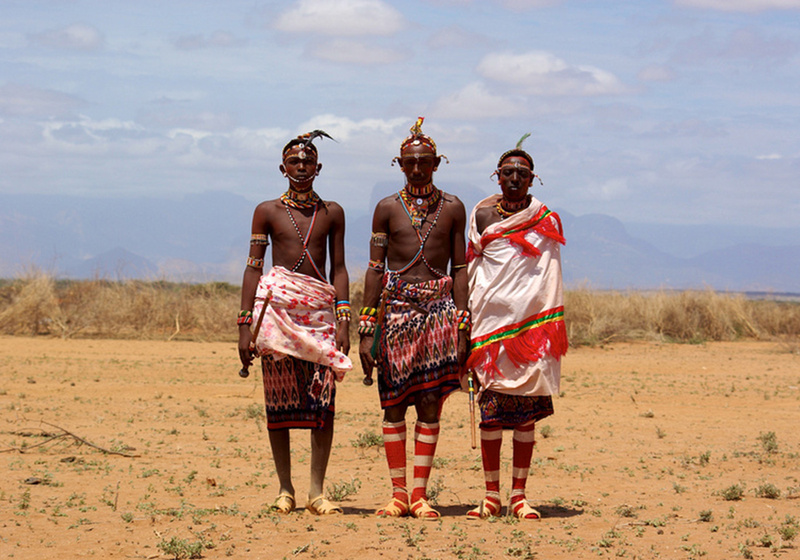 The men undergo various rites of passage to bring them into adulthood; young girls are often spoken for at an early age and marry very young. There is a place in every village called “nahapo”. This is a place of watching and prayer with a fire burning that is never to go out. Every night the men of the village meet there at 8:00pm and one man is designated to lead them in prayer. Religion: The Rendille live between the Muslims to the north and Christians to the south. They rejected Islam since Rendille believe prayer should be made with their faces toward the heavens, not on the ground. They practice a traditional, animistic religion which includes prayer to the moon (which is considered a god), animal sacrifices and worship of ancestral spirits. They also have traditional religious practices that resemble those of Judaism. The name of their god is Wakh. The moon plays an important part in their religion. On the night of the new moon the first-born son of each family blows a horn with an accompanying prayer ritual. 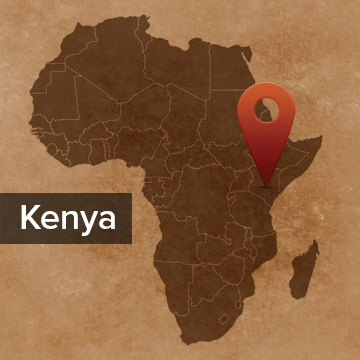 Learn more about the Rendille at Joshua Project or about Kenya at Operation World. Tirrim Secondary School is moving it’s location for second term, April 29th. This site gives us many benefits such as a better water supply, closer to the villages, and far from town so students won’t be distracted. We have come a long way with the building site and we are so thankful. But we have a long way to go. We are praying that God sends someone to Korr to be the project manager. Please pray with us that someone will come and the school will be ready for our students! Two women have been coming to learn how to create and lead a Bible study from a missionary. They’ve done this two weeks in a row now. They come to her house on Tuesday and lesson plan together, then they teach Friday. Both times the women say, ” I have never done this before!” But both have done well! Pray for them to persevere and pray for their groups to grow deep in the word and obey what it says.